Pyramyd Airsoft Blog: So You've Chosen Your PRACTICAL 1st Rifle. What else do you need? So You've Chosen Your PRACTICAL 1st Rifle. So, once you choose a solid AEG option that should, in theory, last you awhile, you'll need to take a few other items into consideration before blowing your entire budget on the gun. Here are some items that are pretty much essential and/or required in order for you to actually go out to a game and play with your beautiful new AEG. 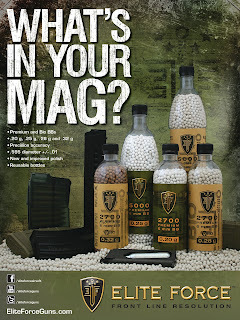 Airsoft BBs (you know, ammunition?) This isn't like your favorite First-Person Shooter (FPS) game where you automatically start out with a bunch of ammo. Nope, this is the cold, cruel and very real world where you have to buy your ammo in addition to your rifle. AEG Batteries (AEG = Automatic Electric Gun). Need I say more? I'll be revisiting batteries again later, but for the time being, refer to this thread (AEG Battery Pack Knowledge) for more specific information regarding the types of batteries available to choose from. AEG Battery Charger Otherwise you won't get too many games in before you run out of juice. Know what I mean, dog baby? Eye Protection It's hard to enjoy looking at all those beautiful guns in your arsenal if you you've been blinded by a BB to the pupil. Tactical Dress Uniform (TDUs). These serve not only a practical purpose, but they also help to make you look like a winner. From extensive personal experience, I've found that the TDUs from 5.11 Tactical not only meets my demanding needs for a set of threads that can hold up against heavy wear and tear, but they also do a darn good job at making me look good in the process of ruining the OPFOR's day. Technically, you don't have to have a uniform to play in most weekly pick-up games. Most larger events usually enforce the dress code a bit more, but I've yet to find a field hosting a pickup game where they turn you away because you're wearing street clothes. However, you will find that you will be one of very few, if not the only one, wearing street clothes, so you might want to consider investing in a set of TDUs at your earliest convenience. So there may be one or two things I might be forgetting, but I'm pretty sure those are the main items that you have to have. Some would argue that you ABSOLUTELY have to have a red dead rag. This is only true if your field requires it. Although, even if it doesn't, I would highly recommend one, as it helps to avoid many unpleasant situations like being continuously shot while you're walking back to the re-spawn point or dead box. That's all for now, therefore, I say to you, "Tootles!"